Some of the recently released coins. Andamiro USA is pleased to announce that it has added 13 new pro players to its roster for its hit game, NFLPA Super Star Football Coins. This arcade gaming innovation reimagines how a skill crane, token pusher and licensed prized content can work together to produce greater entertainment value. 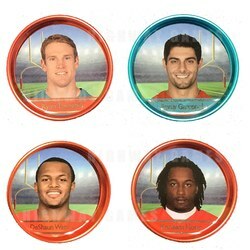 The new coin faces belong to Jimmy Garoppolo, Kareem Hunt, Alvin Kamara, Deshaun Watson, Adam Thielen, Robby Anderson, Melvin Gordon, Christian McCaffrey, Doug Baldwin and Ryan Tannehill, along with rookies Sam Darnold, Baker Mayfield and Saquon Barkley. They join Andamiro's original player coins, licensed by the National Football League Players Association. NFLPA Super Star Football Coins launched last year with a souvenir series featuring 60 players. The 13 new coins will be available in August. When a new game is purchased, it comes with a complimentary supply of 4,284 coins. The new players will soon be a part of that mix. "As we know from testing in a cross-section of location types throughout the country, NFLPA Super Star Football Coins is earning very well," said Andamiro sales and marketing president Drew Maniscalco. "It operates either as a ticket-redemption game or merchandiser -- in the latter case, coin collecting is the added incentive to the player. NFLPA Coins is versatile and offers strong ROI opportunities." The National Football League's next season is right around the corner -- kicking off on Sept. 6 -- so now is the time to stock up on coins or to consider acquiring Andamiro's Super Star Coins game. The 99th NFL season begins with a Kickoff Game that will be hosted by the defending Super Bowl LII champions, the Philadelphia Eagles, challenging the Atlanta Falcons at Lincoln Financial Field in Philadelphia. The season will conclude with Super Bowl LIII, the NFL's championship game, on Feb. 3, 2019, at Mercedes-Benz Stadium in Atlanta. "The NFL Players Association loves the new NFLPA Super Star Football Coins game," Maniscalco said. "Pro football players love it, too, and some have asked Andamiro how they can get their faces on one of our coins. FOOTBALL is still the KING of sports, and entertainment centers are the places where fans can watch games, play games and collect NFLPA souvenir coins." Andamiro would like to remind operators to keep their games well stocked and looking sharp. Distribute equal amounts of red, blue and silver colored coins across the playfield. There are fewer of the highly prized gold coins, hence, fewer should be allocated. In addition, there are only 14 of the rare Tom Brady coins, so begin with seven of those. Concentrate most of the gold coins in the larger center playfield area. Most importantly, promote those new player coins! To learn more about Andamiro's NFLPA games and coins or to discuss promotional ideas, email sales@andamirousa.com or call (310) 767-5800, ext. 4.